Two good inches of rain in 48 hours, and the land comes alive again, after a hot, rainless month. The earth is damp. The bare soil at the edge of a soybean field turns into an impromptu oasis. 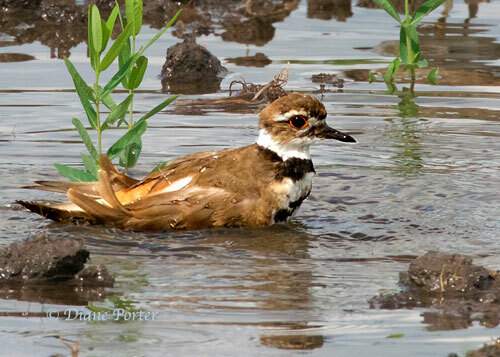 Killdeer wade in and bathe and bathe. 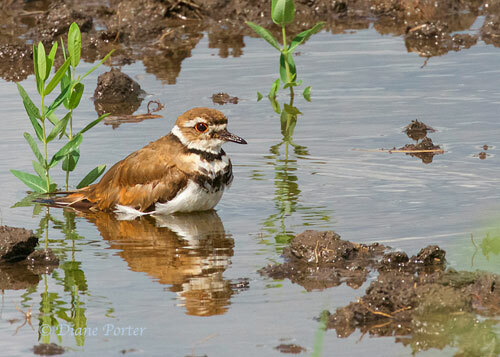 Here's another photo of the same killdeer enjoying the puddle. We like the way its wing feathers seem to curl up in pleasure. This invaluable aid to learning bird songs seems to be going away, as the publisher is not re-issuing editions after they sell out. Already the Backyard version and the Western version are unavailable. The Eastern North America version is still available, but we don't know how much longer it will last. This is how Diane Porter learned to watch birds with her ears. 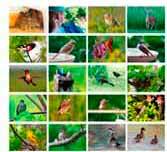 If you live in Eastern North America and want to learn your bird songs, we recommend it to you.